Summary: Below is a quick summary of the questions sent in by readers. Some questions have links to more information on the topic. Is it too late to dust my Gladiolus? What is the right time to uncover the strawberry bed? How can I get rid of small black flies in the soil of house plants? Can you tell me why my potted daffodils failed to flower? What can I do to make wisteria bloom? Is it necessary to roll a lawn every year? Is the spring the right time to prune hybrid tea roses? What is the best way to clean a sprayer? Question: I failed to dust my Gladiolus corms in the fall. Is it too late to do it now? It is better to dust now than not at all, although is is more effective to do it at time of storage. To control thrips, try leaving the bulb unwashed, but allow them to dry. Use a an insecticide-fungicide dust mixture labeled for the specific plant. One way to get good “dust coverage” after the gladiolus corms have cured and dried out is to put a small amount of the insecticide-fungicide mixture into bag, throw in some corms, and give the bag a good shake. Make sure you wear any required protective gear and clothing as specified on the chemical label. Question: What is the right time to uncover the strawberry bed? Answer: The uncovering of the strawberry bed should be a gradual process. If done too early and a drop in temperature follows there will be severe damage. First loosen the winter mulch around the plants, removing it little by little as the days become warmer and danger of frost passes. Plants heaved out by frost should be pressed back with the foot. Question: How can I get rid of small black flies that hover around the soil of house plants? Answer: These are midges, which breed in manure in the soil, or fungus gnats, which breed in decayed vegetable matter in the soil mixture. They do no harm to the plants themselves, but to eliminate the “maggots” in the soil, water plants with a solution of malathion or Neem oil pesticide. Spray the adults with the malathion or Neem oil solution to get rid of as well. Question: Can you tell me why my potted daffodils failed to flower? Pots were dug in the ground where they remained for eight weeks and then brought into a cool greenhouse. Although the bulbs set buds, they were thin and wrinkled and failed to open. Since the bulbs froze out of doors I am wondering if that was to blame. 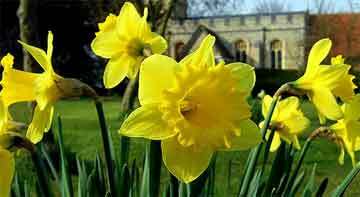 Answer: The failure of daffodil buds to develop properly was probably clue to drying out at some time. Daffodil bulbs will do this even if allowed to dry out for a few hours. Freezing will not cause this, as all kinds of bulbs are subjected to freezing when planted in the garden. Question: What can I do to make wisteria bloom? Answer: This is a common problem with many gardeners. Dig a three-foot trench, 18 inches deep, around the plant (when possible), keeping a safe distance from the trunk. Then mix superphosphate or bonemeal with the soil as it is replaced in the ditch, since these are phosphorous fertilizers which promote the production of flowering beds. In addition, pruning, in some cases severe in nature to cause shock, is also advised. This treatment, best done in the spring, is recommended for flowering dogwoods which fail to bloom. Question: Is it necessary to roll a lawn every year? If so, when should it be done? Answer: Rolling an established lawn every year is not a necessary practice, though there was a time many homeowners seemed to think so. However, it is recommended for a new lawn or one on a light, sandy soil. The best time to roll is in the early spring when the soil has become relatively dry. Question: Is the spring the right time to prune hybrid tea roses? Or should it be done in the Fail? Answer: Early spring before growth begins is the time to prune and clean out established hybrid teas. In the fall, dead, weak and diseased wood should be removed and very tall branches cut back. Then do the same in the spring after the plants have been uncovered, along with the regular pruning, which is much heavier in nature. When removing branches or twigs, make clean cuts just above a good eye or bud. Whether you will cut back plants to eight inches, a foot, a foot and a half or to two or more feet will depend on whether you prefer high or low pruning. Question: I have only one sprayer and want to use it for all kinds of sprays and weed killers. Can you recommend a neutralizing agent for cleaning it thoroughly after using? Answer: Weed killer are extremely injurious to plants even in weak amounts, it is most important to clean sprayer thoroughly after using it. It does not matter if a weed killer or insecticide has been used, sprayers should be thoroughly cleaned and rinsed. However, one method is to rinse the sprayer with plenty of soap and warm water. A second method involves rinsing it several times with warm water to which baking soda. Personally, I would triple rinse the sprayer with water. Fill the sprayer again and spray the last “rinse batch” out. Plus I would never mix sprayers using one for insecticides and one for weed killers. That’s playing with fire! How To Water, Start And What Conditions Episcia Needs?